So, Christmas now well out of the way, as is New Year and we are off again. Firstly a big thank you all my wonderful customers who trusted me with their beloved and treasured pieces over this last year. The uniqui thing about the way we do business is that, because we do not have a retail premises and all our work is done from our custom design studio at home, I get to visit our customers in their homes. This means they can discuss their query, whether it’s a repair or a commission in their own relaxed atmosphere with no pressure and, they can include their spouse, partner or any other family members in helping them make their decisions. It also means that I get to meet their family and all will tell you I am a dog lover! So as well as becoming ‘friends’ with my customers I’m also friends with their dogs AND cats! 🙂 . Taking all the unwanted jewellery of the mother and making wedding band for the daughter. Taking a beautiful 22ct yellow gold Welsh Dragon and mounting it on a 9ct yellow gold textured backing plate. The customer loved the dragon that her husband had made for her, but because of the shape and design, it meant that the dragon pendant would catch in her clothes. So this way by being set on a backing plate it meant that she could wear it with anything. I have made another witches heart pendant. Some readers may recall the original 9ct gold Witches Heart I made for a customer a couple of years ago from her unworn jewellery and her mother’s engagement ring. This was similar only smaller, lighter and the stone was a very pretty pear shaped opal. Plus plenty of others which I will talk about later, and hopefully publish some photos of the pieces. It’s just over a week to Christmas 2018 and I pleased to say I am almost up to date on all the repairs that have been coming in of late. Just a couple left now and they will be finished over the weekend and delivered on Monday. I would like to take this opportuity to wish all a healthy and happy Christmas and a joyous New Year. I suddenly realised that it has been over a year since I last blogged! It never ceases to amaze me how fast the time flies by..
Whatever, I’m pleased to say that I am still busy, doing more and more repairs each month and also starting to get commissions. Recently had a commission from a lady who wanted her late mother’s engagement ring turned into something special. I made her a 9ct. 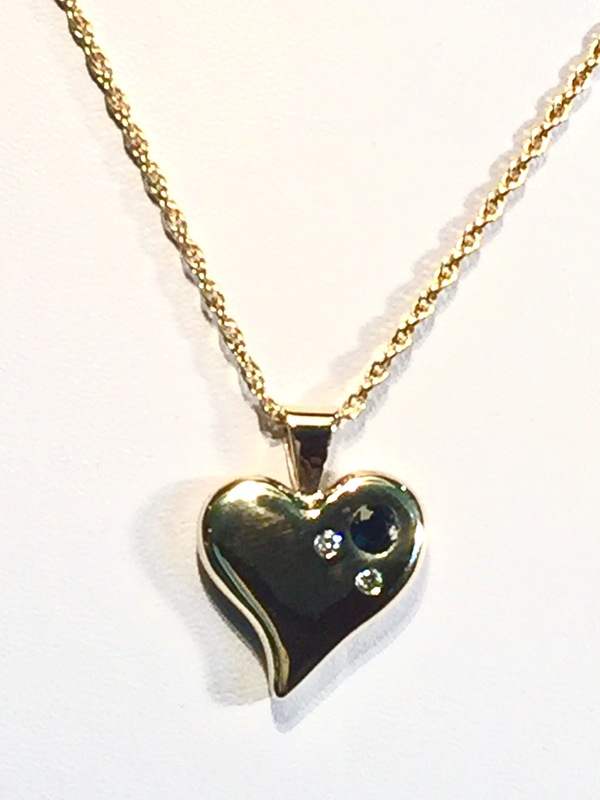 Solid gold heart pendant and set the three stones from the ring into the heart. I was a little apprehensive when I delivered it but the smile on her face and tears in her eyes said it all. We were both very happy with the result. I am presently Working on another commission. This one is for a gentleman who lost his wife just seven months ago, and wants her wedding ring along with his late mother’s wedding ring, not melted together, the two planted on top and around his wedding band. He wants to be able to always see the three rings. Watch this space. I have been working hard recently to build up my collection of hand made jewellery pieces. At the moment I seem to spend about 60% of my time at the design stage and only 40% at the bench. I am trying to improve this but likewise I do not wish to dilute the originality content of the design process. Thus far -to the best of my knowledge – I have not copied anyone, and that is how I intend to carry on. The feed back that I am getting from my customers is that they are happy with my work and it gives them added pleasure knowing that what they are wearing is either a ‘one of a kind’ item exclusive or, one of a Limited Edition number of pieces. If anyone would like me quote them for some special individual and personal pieces for themselves or as a special gift to a loved one, please don’t hesitate to contact me. You can email me at Info@markantonyjewellery.com and I will contact you by return. You can come up with your own specific design or, if you wish, I will be happy to design something especially for you, and this means of course, that there will be no other like it available anywhere, it will be totally bespoke just for you. Moreover, we can use all original precious metals supplied by ourselves or alternatively, if you currently own pieces that you no longer wear we would be pleased to look at them and see if it is possible to re-work the piece into a completely new design. We have a shop on Etsy where a number of our pieces may be purchased or alternative contact us at the above email address for alternative methods of purchase. This is a solid silver handmade pendant, called a Love Key. Hi all once again I find myself apologising for late blogging. However, I’m actually here now and for the first time I’m writing it on my iPhone, never done this before do we will see where it takes us. As far as Change goes, I was thinking of changing my blog into a website, and I was wondering what your views on that would be? Do you have one ‘outlet’ or do you have both? Please let me know your thoughts in the comments, the reason I was considering it, is because I do not have a Sales site for my jewellery other than Etsy. I suppose there is a possibility of selling my goods from the Blog, but I’m not sufficiently converse with WP to be able to do that, but probably worth investigating. I’ll keep you posted on my progress. Many of my readers will recall that I have used this phrase before on a number of occasions. It comes from another fellow Sagittarius Sir Winston Churchill and, it was his term that he used when he was having a particularly bad day with depression. Now I have always tried to be an open book, what you see is what you get, which on a number of occasions in the past haven’t been too helpful. Especially when I was working in a highly political corporation like CBS. I learnt a lot from my American colleagues, not least how to get ahead while others lost theirs! And that can be quite stressful when one has always led their life like an open book. I just found it a nicer way to live, you didn’t have to tell lies, and then remember the lies that you had told and who you told them to, I just wasn’t that clever. I would always take the easy way out and call a spade a spade, those who understood the way I was, accepted that and we got on fine. (That didn’t mean that I was cruel in any way, if I thought a particular instance of honesty would hurt the person, then obviously I would leave it). Those who didn’t like it could go and please themselves, an open-book I was, but never afraid of confrontation! It certainly didn’t hinder my career and I was promoted to all the positions that I aimed for and always gave the best I could. If I liked what someone was doing I told them so, likewise if I didn’t like what they were doing I also told them. That usually didn’t go down that well with my fellow managers, but what the heck….if it was the truth what were they gonna do about it? However, there were and still are days when The old Black Dog comes by. Usually for no apparent reason. One just finds one’s self much quieter and not so ready with the witticism. Thinking negative thoughts instead of being the positive person one has always tried to be. Having said that, I’m old enough now to know how to get out of that state of mind (most of there time that is!) Subsequently by the end of my day I have managed to turn myself around and anyway, yesterday was a great day, a productive day. I had to take my wife for an appointment with her Consultant yesterday at a Hospital 30 miles away. I was all ready and had made all the necessary arrangements, but as it happened she was too ill to travel and at 8.30am she asked me to phone and rearrange the appointment, which I duly did. She then went to sleep for the rest of the day, but considering she was trying to cope with chronic pain still at 5.30am I wasn’t surprised. This meant that I now had a free day and as long as I didn’t leave the house (why would I want to?) I could do whatever I wanted to do. Hence, my day at the bench. And boy did I know it by the time I clocked off. My day consisted of trying out the old ‘Wet Tissue Paper in the ingot mould’ trick, suggested by Jewellery Maker Teacher supreme Andrew Berry . I particularly wanted try this because I had ready only a small amount of Silver scrap to melt down, plus I had the idea that I wanted to make a piece of square wire no more than 100mm long x 1.5mm square. To cut a long story short, it worked to perfection and after a slow natural cooling of period I proceeded to produce the wire in my Durston rolling mill. I say slow natural cooling opposed to quenching because in the past I have had some problems with the wire/ingot cracking, and I have found that if I let the metal molecules reassemble themselves naturally, I don’t see so many cracks and fissures. However, the reason I wanted the wire was because I wanted to make a square-wire heart. I didn’t find it particularly easy but it was very rewarding even though the ‘semi’ finished product wasn’t perfect. But I was relatively happy with the outcome. My next task is to affix a small tube-setting with a stone/gem yet to be chosen and if I can get it up to standard, put it on my Etsy account for sale! Another area of jewellery making that I have come to find both challenging and rewarding is Spoon Rings. Very popular in America but I don’t think the interest is as popular in the UK. At least, I haven’t seen as many Silversmiths selling them as I have in the States. One of the problems I find is that it is difficult to find good quality sterling silver flatware in Wales, and I think that a number of my friends in the trade have confirmed this. One Jeweller who I have mentioned before here, and who is quite the expert at making quality Jewellery from silver spoons is Ginger Meek-Allen however, Ginger produces more lockets than rings, and you should visit her site for an example of some of the beauties she has produced. Moreover, because of Ginger’s influence I spotted this book on Amazon just this week and it is a little treasure trove of information on Spoons! Hello to all my friends out there and a Happy New Year to you all. After about 5 years I am still trying to learn how to effectively use WordPress, but I soldier on with the hope that maybe this year I’ll get a little better at blogging, goodness know I have made enough promised false starts in the past! As some will know I kinda….lost my photography Mojo, something I have loved for over 40 years however, all is not lost I still intend to vista my wildlife patches, but maybe not as often as I used to. Having said that I am enjoying my new ‘Apprenticeship’, that of Jewellery maker/Silversmith/Goldsmith. It all started when my wife asked me to help with a beading project she was doing and needed something soldering, before I could turn around I had a Jewellery workshop! 🙂 I think one of the catalysts to my new passion was finding the Jewellery learning site called At The Bench. At the Bench is an online learning site where members have access to hundreds of films expertly presented by a professional working jeweller Andrew Berry. If you want to learn more about making and repairing and designing jewellery I can highly recommend him. There is a link at the bottom of the page. I think it is safe to say that it is a steep learning curve, that is if you want to design and manufacture pieces that are worthy to be advertised and sold as pieces of jewellery, and not scraps of stuff stuck together, which all your family say “Oh!…you are so clever…that is a beautiful…what?…a Pendant?…Brooch?” 🙂 Which is just one of the reasons I have made a number of very nice and talented friends, most of which have been making jewellery for a number of years from 3 to 30. By showing them what I have made and then listening to their comments and inspecting and watching how they do the same thing, it has made my learning a lot easier than it would have been. Please forgive me if I am repeating myself here and there, but as I said earlier I am trying to become a better blogger! My latest attempt was to make a ring from sterling silver with a silver Gallery Basket setting (I hope I got that right). It took me for what seemed a long time, but in my defence I did keep swapping over to other little projects, which I like to do. I have noticed that if I stay with the same piece I’m making for too long, I have a tendency to become impatient and want to hurry to finish the piece. This is where I start to make mistakes and get sloppy. If I have learnt one thing from Andrew Berry it’s to start as you mean to finish, thats with accuracy and diligence, if you cut corners at the beginning of the project there is no correcting it at the end. Well not when you are a learner anyway, thats for sure. So this is the piece. I should say that there is no way this ring would be for sale because it is not good enough, but at least it will be a record (hopefully) to show how my pieces are improving over time. Firstly an apology to all my faithful blogging friends, an apology for being so delinquent is blogging! I promise I will do better in the coming year (please God)! So, being one who does practice what he preaches I looked inward and wasn’t very happy with what I saw. The competition in my chosen field of Wildlife Photography was such – due to the technological advancement of digital cameras – that every body and his dog was becoming a wildlife and nature photographer. All this was doing to me was creating stress which I did not want, and I had stopped enjoying going out with may camera and seeking special shots. So I took the big step and decided to CHANGE. The change I made was to do something I had thought about for about 12 months. And that was to learn to become a working metalsmith, a Jeweller, someone who can design pieces and the make them at a standard that would be acceptable within the industry. There is of course a Bona Fide entrance to the craft which requires something like a 5 year apprenticeship, but obviously being too old for this I started to investigate other ways of learning. I was very lucky because I actually found a working Jeweller who actually taught the craft and was living and working in Wales, not more than 20 miles from where I live. His name is Andrew Berry and his boutique working jewellery store is in the beautiful Welsh valley town of Ystrad Mynach. Check out Andrew Berry. If any of you are interested in learning a little more about the learning process, let me know and I will give the link to Andrew’s teaching site. So, there we are a major change and I have found a new passion. I have partially converted my old photographic studio into a proper workshop/studio. There is a lot more to do to get it right, but it’s working and, I have actually started making sales! Only small ones, but enough to give me confidence in my work and confirmation that I must be doing something right! Sterling silver ring with 9ct gold band. We have a number of commissions at the moment including a couple of album sleeves, some Pack shots for a web design client and the design and production of posters and leaflets for an advertising campaign for an existing client. So all in all quite busy in our own small way, which how we like it. Mark Goodwin on If it ain’t Broke? arloforbes on If it ain’t Broke? A pic of the Cartier Russian wedding ring showing the joint from the last upsize, apparently by a Jeweller in the ‘Quarter’ Brum. I was asked to upsize a Russian wedding ring by 4 sizes. The ring was made by Cartier but was around 40 years old, and had been upsized before. This is a pic before. An engaged couple asked me if I could make a wedding band for the groom, from an 18ct yellow gold chain that his late father always wore. They were quite specific in as much as they stated that the ring should be a minimum of 4mm wide and be engraved both inside and outside of the piece. Made these sterling and tube set diamond earrings for a customer, from jewellery she no longer wore. Only to be told a week later that she couldn’t wear them because they were too heavy for her lobes. Completed a pair of sterling studs for a client. She provided the gems, which I think were Beryl, but I may be wrong. In another lifetime I spent 20 years as a Management & Training Consultant. One of the contracts I had was to deliver Management and business start-up training to prisoners in a number the prisons in Wales. During my lunchtime I would try and get out just to have a break from being ‘banged up’! At this particular prison which was out in the country I would take my camera and eat my sandwiches in the car. I would park not too far away from the rubbish area, and I would watch a number of the birds and various animals come to pick up food from the waste. I caught this grey squirrel stealing a piece of toast. I should know what this caterpillar is but am a wee bit too tired to look up after a hectic day at the bench and on the road delivering repaired Jewellery pieces to clients. Talk about challenges. A customer said it was a special ring and could I save it? I ended up replacing about 75% of the 9ct shank. Jake and Rosie, always know how to chill. A commission for a customer who wanted a few little bits of 9ct gold and a pear shaped opal turned into. Pendant. Pearced Witches heart, Opal set in Sterling bezel setting. The last book I bought and enjoying very much. By Robert Wooding. Had the pleasure to work on this very old watch chain bracelet. Customer wanted two links added. Every link is stamped 15.625. Which calculates at 15ct. New one on me. I used 18ct to make the new links. And added a safety chain.